Report the Truth. Do It Well. The Master of Arts in Journalism is designed to immerse you in the fast-paced world of converging media. Presented from a Christian worldview, it will equip you with the latest reporting and technical skills for both traditional and digital media application. In addition, this online masters in journalism degree includes social media and internet marketing, helping you to deepen audience engagement. Gain advanced knowledge in traditional and multiplatform reporting, and mobile field production. Learn how to get work published in professional media outlets. Be mentored by faculty members who teach on campus in Virginia Beach. Gather data, write and edit news reports for multiple media platforms (print, television and new media). Write features and editorials on business, politics, national affairs and more. Apply current internet, social media, and mobile media marketing strategies to drive audience engagement. Software and web-based tools used in the production and distribution of multimedia and mobile news content. Includes essential programming languages such as HTML, CSS, and Java-Script and learning computer-assisted journalism that integrates technology with high quality news-authoring. Multiplatform production lab included. Prominent historical and theoretical perspectives of media and popular culture and their influence on individuals and communities from a Christocentric worldview. Provides media professionals and emergent scholars with an understanding of the role of media and narrative in the development of worldviews. Cross-listed with COM 600. Media industry research methods, evaluation and analysis techniques, including surveys, content analyses, polling, data mining, in-depth interviews, and focus groups. Common research practices of professional journalists, public relations practitioners, film-television professionals, media analysts and consultants, and communication scholars are examined. Web-based lab included. Cross-listed with COM 601. Current internet, social media, and mobile media marketing theories, strategies, tools and practices. Includes study of communication methods used by professionals in journalism, film, television, advertising, public relations, and related professions to brand, promote, and distribute products and services. Web-based production lab included. Cross-listed with COM 607. Professional journalistic practices of news reporting and storytelling within the multi-media environment. Students work to master writing mechanics and investigate, research, interview, gather data, and edit stories in multiple journalistic genres. Prerequisite or co-requisite: UNIV 500. Techniques and writing styles required for feature writing, editorials, essays, blogs and for in-depth stories in business, politics, health, entertainment, religion, national and international affairs. News production lab included. Current issues in media law and ethics governing the creation, production, distribution and ownership of media content, focusing on new communication technologies and services. Issues addressed include intellectual property, freedom of the press, privacy, obscenity, libel, licensing and contracts, guilds and unions, and consumer rights and protections. Cross-listed with COM 614. Contemporary principles and practices of leadership in media-related organizations, both commercial and non-profit, through a biblical lens. Includes current theories on leading organizational change, virtual teams, and entrepreneurship. Lab included. Cross-listed with COM 628. Professional principles, aesthetics, and field craft of news reporting and producing for dissemination across multiple media platforms, including use of mobile technology. News production lab included. Community and citizen reporting in the development of news and information. 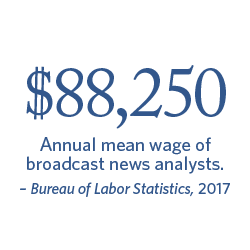 Includes investigating, writing, producing and creating local and regional news, including analysis of common strategies and practices employed to cover community issues and events and to engage civic leaders and organizations. Includes production of weekly news stories.